USB 2.0 Compact 4-port Hub - Custom Sensors, Inc. 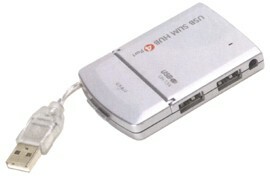 The Model UH-254 is a compact 4-port USB 2.0 hub designed for use with notebook computers. The slim shape allows it to be stored in an unused PCMCIA slot. It is compatible with both Windows and Macintosh computers and can connect up to 4 USB 2.0 devices. It can be used as either a self powered, or BUS powered hub. A power supply is included for the self powered mode.